As of 2016, it's been a decade since James Ketchum finished his data-heavy addition to the history of the Cold War-era experimentation on US Army personnel with psychoactive agents. He has been malgined, sued, and has been interviewed numerous times about this issue. Still very mentally acute at over 80 years old, Ketchum provides permission for permanent archiving of his works on Erowid. If you are interested in the topic. Chemical warfare watchers, from scientists to policy advocates, often wonder what went on at the Army Chemical Center during the 1960s. 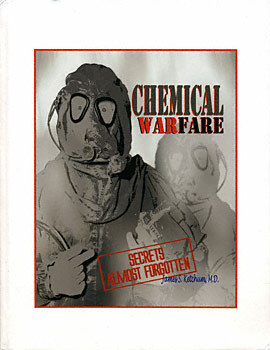 It was a decade in which thousands of Army enlisted men served as volunteers for the secret testing of chemical agents. The actual historical record, however, has until now remained disturbingly incomplete. What chemicals was the Army studying? Why was the program never fully documented in books available to the public? Who planned and carried out the tests, and what was their purpose? How, and by whom, were the volunteers recruited? How adequately were they instructed before giving their informed consent? What long range effects, if any, have been found in follow-up studies? The author spent most of a decade testing over a dozen potential incapacitating agents including LSD, BZ and marijuana derivatives. His 380-page narrative, loaded with both old and recent photographs, derives from technical reports, memoranda, films, notes and memories. Written primarily for the general reader, but supplemented by a voluminous appendix of graphs and tables for the technically included, Dr. Ketchum's book combines a subjective diary with an objective report of the external events that shaped and eventually terminated the program. Informal and autobiographical in style, it includes numerous amusing enecdotes and personality portraits that make it simultaneously intriguing and informative. James S. Ketchum, M.D. is a board certified psychiatrist and Assistant Clinical Professor at UCLA, who received his education at Dartmouth and Columbia colleges, Cornell Medical School, Letterman and Walter Reed Hospitals, and Stanford University. In addition to his research at Edgewood Arsenal, he has broad experience in the area of alcohol and drug abuse and has published numerous scientific articles and book chapters. His teaching activities include many invited lectures, seminars and the direct supervision of medical students. As a clinician he spent 30 years in hospital and office settings, as well as a variety of community clinics and residential treatment centers. Currently he resides and writes at home in Santa Rosa, California.